Spectrum/The annual lighting of the trees on the Village Green in New Milford was held Nov. 24, 2018. The event was held by the Greater New Milford Chamber of Commerce. The trees are put up annually by the United Methodist Men at the New Milford United Methodist Church. 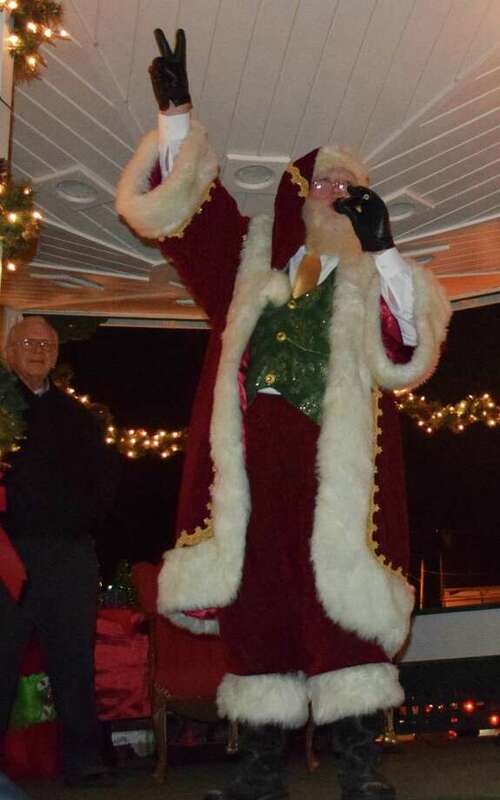 Above, Santa leads the crowd in counting down to the lighting of the trees. The Christmas trees were lighted along the Village Green in New Milford Saturday night. The annual event, hosted by the Greater New Milford Chamber of Commerce, attracted a crowd of residents and neighbors and coincided with Small Business Saturday, a day that encourages people to shop at small businesses. A highlight of the event was Santa, who spiritedly led the crowd in a countdown until the trees were lighted, then visited with children at the bandstand. The tradition of the trees on the Green was started by Walter Schutte in 1967 and the practice continues in his memory. Members of the New Milford United Methodist Men’s Club and other church members donate their time and effort to cut the trees down, place them on the Green, string the wires and the lights, and take them down shortly after the New Year.